Essentially, a Blue Community makes three commitments: to protect and promote water as a human right; to protect and promote the public management of water; and to phase out bottled water on municipal premises and at municipal events. These pledges mean no privatization of either drinking water or wastewater services. It also generally entails installing water refill stations on municipal property to promote tap water and make it more easily accessible. The Blue Communities project was launched 10 years ago, when the Harper government was promoting public-private partnerships for municipal water services. The Council of Canadians and the Canadian Union of Public Employees came up with the Blue Communities project as a way for municipal councils to reject privatization in principle before pressure to privatize could be applied. In 2010, the UN General Assembly formally recognized the human right to water and sanitation, a huge step forward that shifted the debate from one of “charity” to one of justice. A Blue Community recognizes this and vows to promote water justice. As well, since 2000, 267 municipalities around the world that tried privatizing their water services have changed their minds after terrible experiences and brought their water services back under public management. A Blue Community pledges to maintain that public oversight and control. A Blue Community also promises to do its part to deal with the global plastics crisis. Every minute, one million plastic bottles are bought around the world and over 90 per cent of them will not be recycled. We are destroying our waterways and oceans with these mountains of garbage. Today, more that 15 million people worldwide live in towns and cities that are official Blue Communities, and the number is growing. Recently, several universities and faith-based communities have also become Blue Communities, including the World Council of Churches and McGill University, which shared the ceremony with the City of Montreal last week. Ours is a planet running out of clean accessible water, and not just because of climate change. We are polluting, mismanaging, diverting and depleting accessible water sources so fast that by 2030, demand will outstrip supply by 40 per cent. Today, two billion people are forced to drink contaminated water every day and 3.6 billion live in areas of water shortage. The United Nations tells us this number could grow to five billion in 30 years and seven billion by 2075. Canada is not immune to the water issues now threatening so many parts of the world. It is past time we stopped taking our water for granted. In becoming a Blue Community, Montreal has shown incredible leadership in the movement to protect water and water justice for future generations. Of course, this does not magically solve all problems related to water in Quebec. Montreal still dumps thousands of litres of untreated wastewater in the St. Lawrence River every year, and threats of contamination of the city’s water supply still loom upstream. 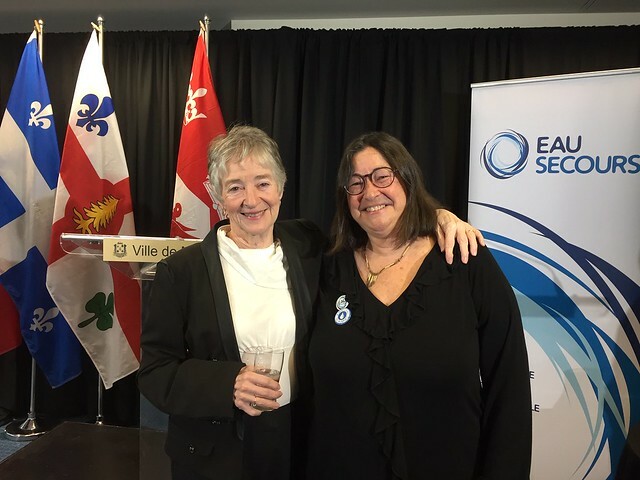 Eau Secours and the Council of Canadians will not ignore these important issues just because they have recognized Montreal as a Blue Community. On the contrary, we intend to use the commitment the city made to protect water as a human right as a means to encourage city officials to take bold actions to protect our water sources, and those of other municipalities downstream of the St. Lawrence River. Let’s dream of a world going “Blue,” one community at a time. Maude Barlow is the honorary chairperson of the Council of Canadians and author of the upcoming book Whose Water is it Anyway? Taking Water Protection into Public Hands. Alice-Anne Simard is the executive director of Eau Secours.